Amazon announced that its flagship streaming device will stream 4k Ultra HD video and support Alexa. The new Amazon Fire TV will be released October 5, 2015. You can now pre-order on Amazon.com at the same cost of $99! Apple also recently released their updated Apple TV. Let’s see how this holds up. 4K Ultra HD quality TV is no doubt the next big thing. However, you may wonder the same dilema we had with 1080p HD when it first came out. Content. There were very little content that was true 1080p HD. Amazon answered this. Amazon promised that they will be creating original and exclusive content in 4k. The Fire TV will also support Netflix’s 4k content as well. There will be no upcharge to stream in 4k vs. 1080p or lower quality like SD content. Also, even if you do not have 4k TV, you will benefit from Amazon’s support for HEVC (high efficiency video coding) which makes streaming high quality content more efficient. One other feature that would be welcomed by Amazon fans is Alexa support. Many people got a taste of Alexa through Amazon Echo. Fire TV and Fire TV Stick remotes will have Alexa support through its voice enabled remote control or through the Fire TV app. Through Alexa support, you can use your Fire TV to replace the Echo. Wi-Fi Connectivity Dual-band, dual-antenna Wi-Fi (MIMO) for faster streaming and fewer dropped connections than standard Wi-Fi. Supports 802.11a/b/g/n Wi-Fi networks. Wi-Fi Connectivity Dual-band, dual-antenna Wi-Fi (MIMO) for faster streaming and fewer dropped connections than standard Wi-Fi. Supports 802.11a/b/g/n/ac Wi-Fi networks. TV Compatibility Compatible with high-definition TVs with HDMI capable of 1080p or 720p at 60/50Hz, including popular HDCP-compatible models from these manufacturers: Hitachi, JVC, LG, Mitsubishi, NEC, Panasonic, Philips, Pioneer, Samsung, Sharp, Sony, Toshiba, Vizio, Westinghouse TV Compatibility TV must support minimum HDCP requirements for protected content playback. Learn more. Compatible with (1) 4K ultra high-definition TVs with HDMI capable of 2160p at 24/25/30/50/60 Hz and HDCP 2.2, including popular models from LG, Samsung, Sony, Sharp, Toshiba, Vizio, and others or (2) high-definition TVs with HDMI capable of 1080p or 720p at 50/60 Hz, including popular HDCP-compatible models from Hitachi, JVC, LG, Mitsubishi, NEC, Panasonic, Philips, Pioneer, Samsung, Sharp, Sony, Toshiba, Vizio, Westinghouse, and others. Warranty and Service 1-year Limited Warranty and service included. 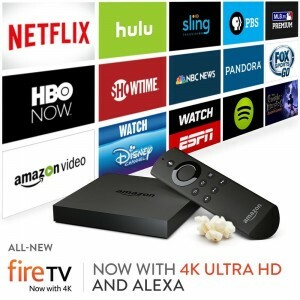 Use of Fire TV is subject to the terms found here. Warranty and Service 1-year Limited Warranty and service included. Optional 2-year and 3-year Extended Warranty available for U.S. customers sold separately. Use of Fire TV is subject to the terms found here. Regional Support Certain services may not be available outside the U.S. Regional Support Certain services may not be available outside the U.S.
Closed Captioning Watch videos and TV shows with closed captioning displayed. Captions are not available for all content. Closed Captioning Watch videos and TV shows with closed captioning displayed. Captions are not available for all content.